The Intimus 14.87-6X50MM Cross Cut Shredder with Baler saves time and money. The shredder and baler operate in tandem with electronic compacting chamber level monitoring and an automatically triggered compressing stroke. Shredder can still be fed while baler is compressing waste material. When baler is complete, shredding process is halted. A pushbutton control is integrated for bale ejection and two straps ensure stable bales. Additionally, baler features a separate opening for reducing cartons and small boxes. 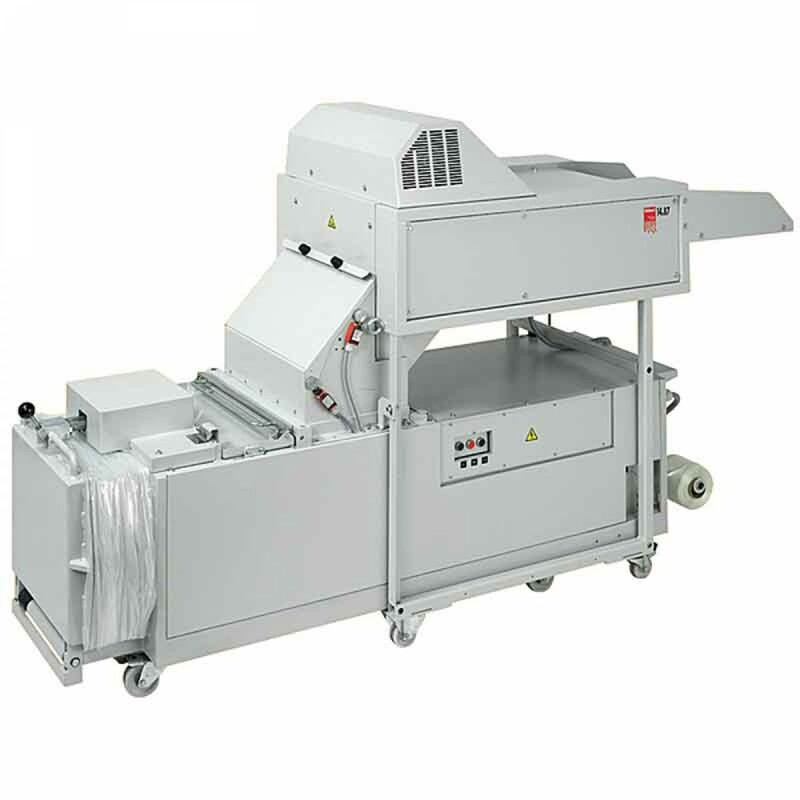 The economical supplement to the large document shredder: the shredded material is automatically compressed into compact bales, feeding via conveyor belt, dosage paddles pull not only smooth, but crumpled paper in the same way, rugged, wear-resistant cutting rollers made from high-grade steel for optimum cutting performance, High-power, thermally protected geared electric motor with automatic delta-wye-start, 440 mm working width; suitable for all standard computer formats, shredded material is automatically pressed into compact bales, shredder and baler operate in tandem, electronic compacting chamber level monitoring, compressing stroke is triggered automatically.